The 2010 MFIA membership stands at 175 members representing 70 percent of the planted production forest area, all major processing companies, contractors and the Port Company. The governance of the MFIA is the responsibility of the Executive Committee comprising a President, and between three and ten members. Members of the Executive are elected at the Annual General Meeting of the MFIA, held in October each year. MFIA is active in making submissions to Government, the Marlborough District Council and Marlborough Roads on issues that affect forest growing and processing companies, contractors and the Port Company. 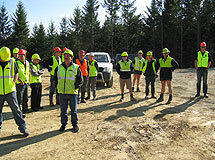 The Association is the "voice of forestry" in Marlborough and is the main contact for media enquiries, and media articles relating to the sector. Members receive 3-4 newsletters during the year and have the opportunity to attend field days, technical seminars and training courses. MFIA supports local forestry education initiatives and sponsors the annual prize for the top pupil in the forestry course at Marlborough Boys College. The Association also supports the Marlborough Rural Environmental Awards and provides judges for the forestry entries. MFIA takes an active part in regional fire planning and administration and provides financial support to Marlborough Regional Fire District on behalf of members.